See how the numbers stack up. 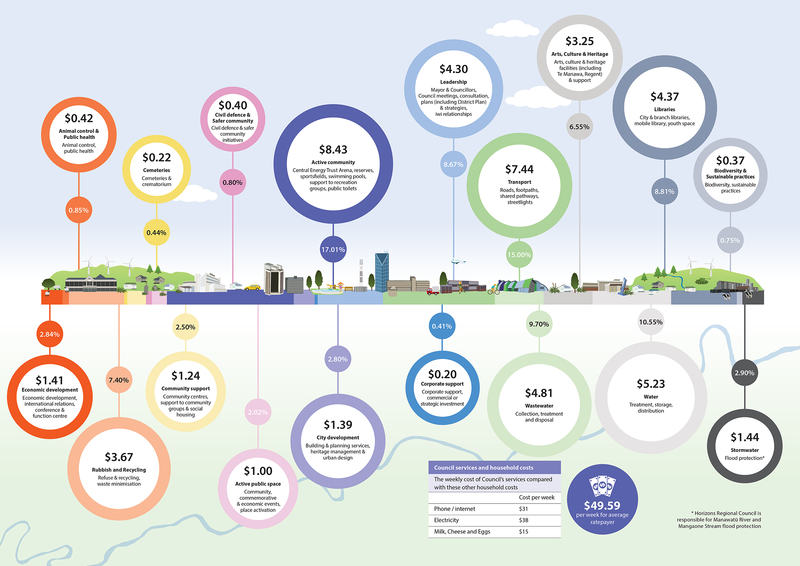 Council has assets with a replacement value of over $1.7 billion which are generally in good condition and are sized appropriately to cope with significant city growth. Our current debt levels are moderate for a regional New Zealand city (especially given the range and quality of services provided). Rates levels are comparable with districts of our size in New Zealand. We are planning for high population and household growth over the next 10 years and medium growth beyond Year 10 with adequate appropriately zoned land to cope with the first 10 years of growth. The Council believes it is necessary to invest in new improved catalyst projects to meet its vision and goals for the city. The requirement to update the city’s wastewater treatment and disposal system provides the greatest single challenge to the long-term financial sustainability of the Council. At the present time it has been assumed an acceptable option will be obtained for $110m (plus inflation) but there is a high level of risk it could cost more than this. 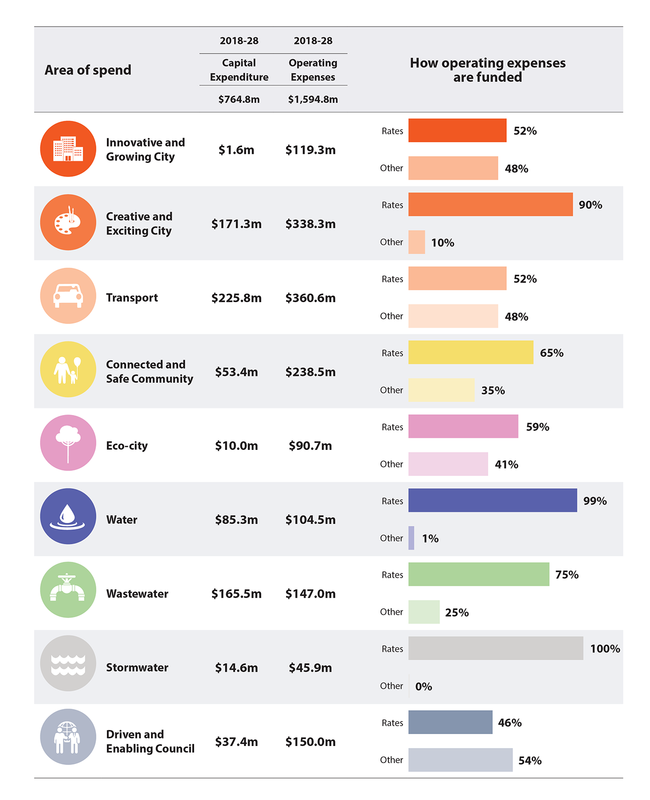 In order to fund existing council services and key projects we are proposing in this Plan, including new capital expenditure of $506.8m, our rates and debt levels will need to increase – debt increasing from a forecast $109m to $349m. To help manage the additional debt we are proposing that rates be increased now to enable the term of our debt to reduce from 30 to 20 years – this would mean $45m more of the debt would be repaid over the 10 years than was originally planned. Paying down the debt faster reduces the interest cost (much like a mortgage). Total rates would need to increase by 6.4 per cent in 2018-19, 5.6 per cent in 2019-20, 5.8 per cent in 2020-21, and increases of between 2.6 per cent and 6.6 per cent in each of the following seven years. In order to fund existing Council services and the key projects we are proposing in this plan to deliver on our vision, rates will need to increase. The rates increase includes the cost of our proposal to pay down our debt faster to deliver significant long-term savings from paying less interest (just like a mortgage). We are proposing to reduce the term of our debt from 30 to 20 years. This saving can in turn be put to use on other projects to deliver on our vision. We are committed to ongoing identification of innovations and efficiencies that enable us to minimise rates increases, while still delivering for our community. This aim to keep rates increases as low as possible has to be balanced with the need to continue to fund the maintenance and renewal of key city infrastructure and the need to plan for a higher level of debt repayment to create sufficient capacity to service debt associated with any future high priority capital programmes. Over the 10 year period the Council’s aim is to limit rates as follows. Total rates will be no more than 2% of the city’s rateable land value. 1 Total rates excludes rates on Council properties but includes metered water revenue. 2 The Local Government Cost Index is an overall cost index developed by BERL for local authorities. 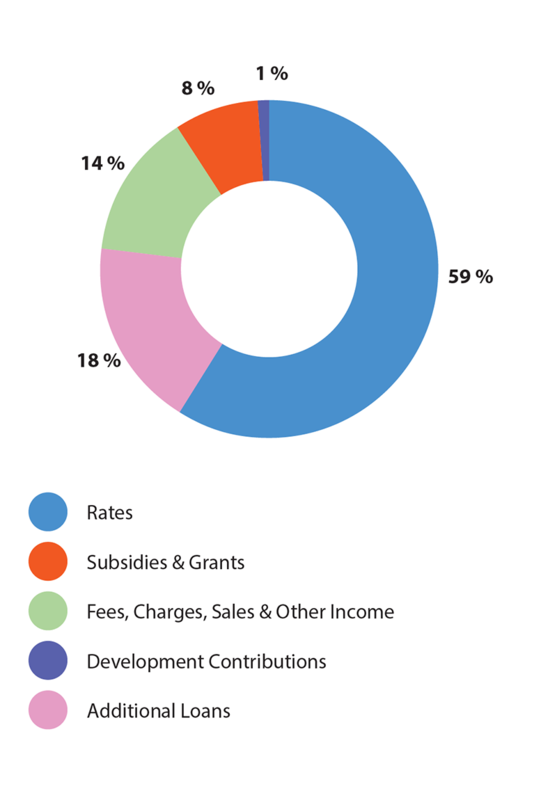 It is based on the cost structures of local authorities and includes operating expenditure and capital expenditure variables. The forecast index used in this plan was published by BERL in September 2017. 3 This allowance reflects the effect on rates of the additional debt the Council has decided it is prudent to repay earlier than had been previously planned (i.e. by repaying over a maximum of 20 years rather than 30 years). For 2018-19 this is the equivalent of 1.7 per cent of total rates. The proposed increases in total rates each year are shown in the following graph. At this stage the proposed 10 Year Plan does not achieve Council’s policy aims for some of the years. To meet our vision and goals for the city, Council believes rates need to increase by more than our policy limit, at least in the short term and then again when the full impact of the proposed upgrade to the wastewater treatment and disposal system takes effect. The actual increase each year will be determined in the light of updated circumstances and the development of the Annual Budget. Rates are made up of two parts, a fixed part which is the same for each property and a variable part based on the land value. For residential properties, each of these fixed charges (except for the general charge) is based on the number of separately used or inhabited parts. The variable charges (based on the land value) vary depending on the nature of the use of the property. It is proposed that the definitions of each of the types of use will be changed in an effort to make them easier to understand and administer. These changes will not affect most properties. A few, particularly those which are vacant, may be classified in a lower rated group than they currently are. You can look up the proposed rates for your property for 2018-19 using the search tool on the City Council website. Non-residential examples don't include rates for wastewater based on the number of toilet pans or water charged by meter. The proposed charge per pan is $250. Metered water is charged on the basis of a fixed amount (depending on the size of the connection) and the balance by the volume used. We propose to increase the fixed amount for smaller connections by a significant amount so that such users pay a minimum amount similar to the charge made to residential users. Council divides its services into activities. 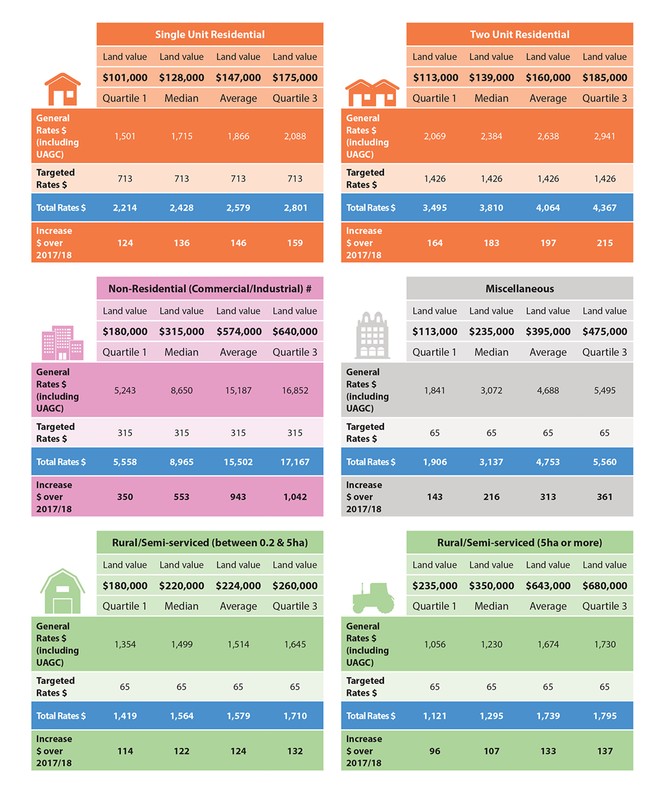 This infographic shows the weekly costs (including interest and debt repayment) of the Council's services for the average residential ratepayer (2018-19). Council needs to borrow to fund major new capital developments in the same way individuals do when they need a new home or car. Our debt is also a way of sharing the costs of these projects across today's ratepayers and future generations who will also benefit from these projects. To help decide the maximum level of borrowing that is sustainable, Council proposes to adopt the following policy limits. We are proposing to increase the policy maximum for the net external debt as a percentage of total revenue ratio to 200% (from the previous level of 175%). This is considered appropriate to enable the Council to borrow the amounts which are projected to be necessary to undertake the proposed capital development programme and in particular the significant upgrades which are required to the wastewater treatment plant. At this stage there is a high level of uncertainty over the likely costs for the plant upgrade and the ongoing operating costs thereafter. As the various options for this project are developed and costed they will be built into our budgets. This could lead to us reconsidering our debt and rates policy limits and our priorities for other projects. All of this will be done in consultation with residents. The debt to total revenue ratio limit of 200 per cent is exceeded in one year of the 10-Year Plan. Given the level of uncertainty in relation to the forecast costs, the Council has determined that for the time being the forecast programme of capital development and the consequential borrowing requirements are appropriate. The proposed capital expenditure over the 10 years of $765m is made up of $258m for renewing present assets and $507m for building new assets. 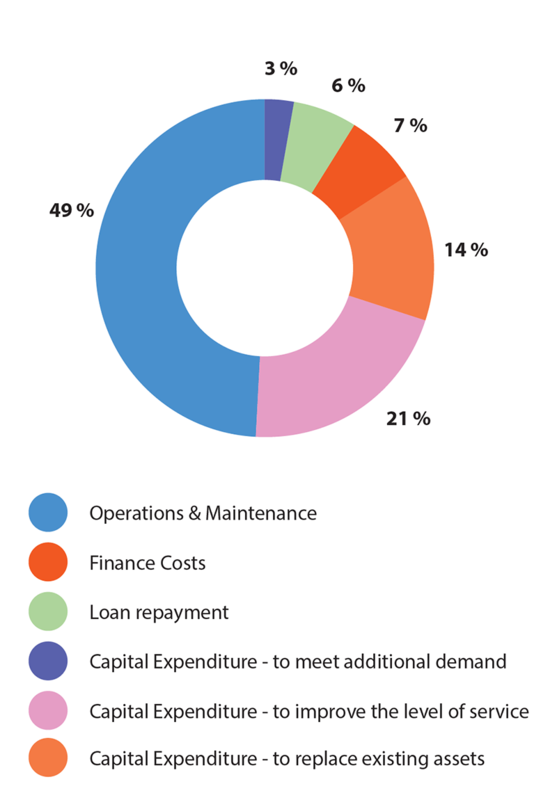 In order to fund capital expenditure, the Council will need to borrow an additional $377m. During the same period, $128m will be raised through rates to allow us to repay some of our debt. This means the Council’s debt is forecast to increase from $109m to $349m over the 10 years. This is based on the assumption that the borrowing for the wastewater treatment project will be $128.8m. Remember it could be more than this. One of Council’s major roles is providing and maintaining the city’s infrastructure. This covers transport, stormwater, wastewater, water, property and recreational assets. These all underpin economic and social activity and help maintain the health of the environment. The total replacement cost of this infrastructure is $1.7 billion. The bulk of this infrastructure is in the early to mid-phase of its life and in a good condition, and surveys have shown that most people are satisfied with Council’s infrastructure. Nevertheless, it is still expensive to look after, and we currently spend around $14 million a year renewing it. This will gradually increase as the infrastructure ages and as we build more. We also need to replace some older water pipes in the next few years to reduce maintenance costs. We expect to spend an average of $18.6m a year (present day cost) over the next 30 years to keep the assets in a good condition. The Council has significant decisions to make about its infrastructure over the next 10 to 30 years. The single biggest is the wastewater treatment plant upgrade. This and other major projects are detailed on this website. Infrastructure resilience: following the Christchurch earthquakes councils are putting increased focus on understanding and improving the resilience of their core infrastructure. We've reviewed the possible impact of earthquakes and floods on our infrastructure, particularly for roading, water and wastewater. Generally our infrastructure has the ability to withstand major earthquakes and floods. In some cases remedial work is required (eg the Milson Line Overbridge in 2028-31, $6.7m). Some more detailed seismic assessments are scheduled for the Turitea Dam. Water supply security: Palmerston North has a generally good water supply. It comes primarily from the Turitea dam and is supplemented by bores across the city. In recent years summer droughts have led to the need for gardening water restrictions to ensure that residents and businesses have enough water for consumption and sanitation. Central government is also reviewing the New Zealand Drinking Water Standards following the 2016 contamination in Havelock North. Our 10 Year Plan includes funding to refurbish the water bores, duplicate the pipeline between the water treatment plant and the reservoirs supplying the urban areas, and provide extra treatment to meet the expected new standards. Climate change impact: We have a target of reducing greenhouse gas emissions in Palmerston North by 25 per cent by 2028. To do this we are improving the energy efficiency of our infrastructure, making more use of trees and natural systems, and using new technologies like LED lighting. We're providing more infrastructure to enable people to make low-carbon choices, particularly in transport. We're also improving our stormwater network so it can better handle more frequent heavy rainfall, and the impact of infill development.